Amen is one of the children of Governor Rochas Okorocha of Imo State, the 5th child actually. 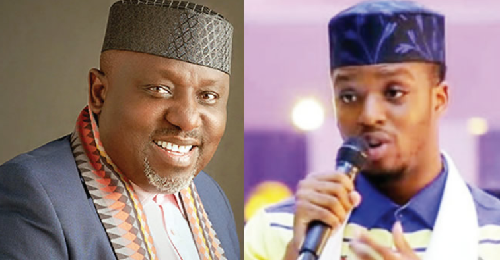 Amen speaks about growing up as Okorocha’s son, what he does for a living, and how he is not interested in politics. I am an engineer and I have a construction firm. I am the founder of Juremi Foundation which caters for physically-challenged persons. On my birthday held recently, we unveiled a skill acquisition centre in Abuja. We will be teaching people living with disabilities tailoring, computer and music. How did your dad react to your decision to establish a foundation? He was really happy for me; he was excited and proud of me. He told me I would never lack once I continue to give. I didn’t establish the foundation to get attention from the public. I just want to help people and to show others that they can also help others. My father doesn’t play a major role in the foundation. Nevertheless, he has been a big influence in my life and he is responsible for all the things I know about finances today. But the foundation is my personal project. Do you have plans to join your father in politics? Everyone thinks I have an interest in politics, but my biggest interest is in the foundation and my business. For me, politics is like a service. Before my father joined politics, he was already a successful businessman. Right now, I am not thinking about politics; I just want to touch lives positively. Is any of your siblings into politics? None of us is into politics. We are into business. Was there a time your father tried to encourage you to join politics? He has never asked me to become a politician. But while I was younger, like any father, he spoke to me about my interest. As a father, he allows his children to do what they like. How would you describe your upbringing as Rochas Okorocha’s son? I was born in Jos, Plateau State, and I had my primary and secondary education there. We lived a comfortable life. Though we didn’t attend expensive schools, my parents were always there for us. I have five siblings – I am the fifth of six children. We have three boys and three girls. As a kid, my best friends were from Rochas Foundation Colleges. We started the foundation over 20 years ago; so, I grew up with the kids. Over 17,000 people have passed through the colleges, but I only know the first two set because we grew up together. That is why I tell people that I have many sisters and brothers. I shared my father with a lot of children and it was a bit confusing for me. We were treated equally and I never grew up with a rich man’s son mentality. When we wrote things needed for school, my mother would reduce the list and told us that we were not better than the kids in the foundation. Was there a time you felt you didn’t get enough attention from your parents? It was impossible to feel one wasn’t getting enough attention. Growing up, there was no time I was in the house with only my mother and siblings. We had other kids who lived with us at different times. I could remember that many kids came to seek shelter in our house when there was a riot in Jos. I grew up in a fun-filled household and there was never a boring moment. I am proud to be part of such a family. Do you feel pressured to be as successful as your father? I felt such a pressure at a time. When I started my first business in transportation, it was out of fear and concern for my future. I was so concerned about how to carry all the expectations of people as Rochas son. But after a while, the fear vanished. As we speak, I am not under any pressure because God is our rock in my family.